The Dodgers (5-2) had some shaky moments during their first homestand of the season, but their red hot offense helped them overcome some early season bullpen woes to win the first two series against the D-backs and Giants. They lead the NL in slugging percentage (.557), OPS (.945), and have hit the most home runs in the majors (18). #Dodgers enter the first road trip leading MLB scoring 8 runs/game. Behind that: they lead MLB in HR, walks, hitting w/ runners in scoring position, and avoiding strikeouts. (.197/.245/.283/.528) has struggled through the first seven games. Granted they had to face some tough pitching in their series vs. Tampa Bay including Blake Snell, the reigning AL Cy Young winner. The Rockies biggest signing in the offseason was first baseman Daniel Murphy on a two-year $24 million deal. 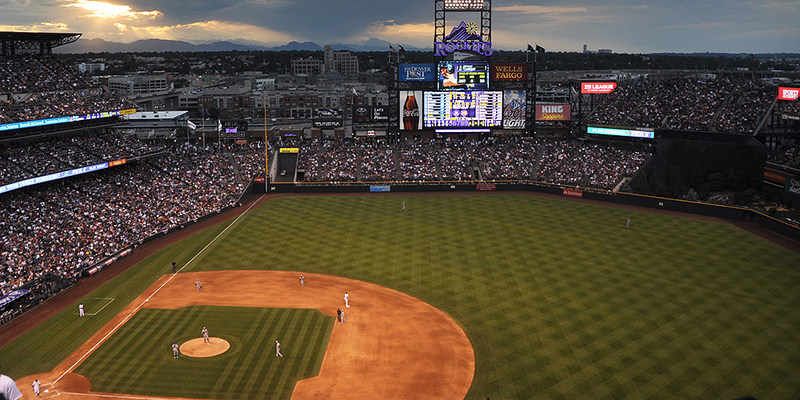 The Rox won’t have Murphy to torment the Dodgers this time around. He’s expected to miss four to six weeks after suffering an avulsion fracture to the tip of his left index finger while diving for a ground ball last Friday. The Rockies may have had a rough start to the season, but as we all know, Coors Field games are like playing baseball in an alternate universe. Win or lose, I’m always relieved when everyone leaves Denver with all their limbs intact. Kenta Maeda (1-0, 4.05 ERA, 7.88 FIP) makes his second start of the season. Last time out against the D-backs, he picked up the win, striking out six and walking two in 6.2 innings and 106 pitches. He did give up three home runs, so he’ll need to try to keep the ball in the park at Coors. That’s not an easy task. Maeda has actually pitched well at Coors and is 4-1 with a 3.19 ERA and 35 strikeouts and eight walks in 31 innings at the Mile High torture chamber. Overall, in his career, Maeda’s 5-3 with a 2.30 ERA and 0.970 WHIP against the Rockies in 15 games (eight starts). Chris Iannetta is 5-for-15 (.333) with two home runs vs. Maeda, and Charlie Blackmon has a couple of doubles and a homer against him as well. Tyler Anderson (0-1, 9.00 ERA, 1.71 FIP) gets the ball for Colorado’s home opener. In his first start of the year, against Miami, he was pegged with the loss after he allowed five runs on nine hits in 5 innings and 85 pitches. The southpaw is 3-4 with a 3.99 ERA and 1.378 WHIP in 12 career starts (65.1 innings) against the Dodgers. At Coors, he’s 11-11 with a 3.73 ERA (third-best home ERA in club history) and 200 strikeouts in 214.2 innings. Clayton Kershaw pitched his first rehab game in Oklahoma City yesterday. Kershaw retires leadoff batter in fifth inning and is then removed. 4 1/3 innings, 2 runs, 4 hits, 6 strikeouts, 2 walks. Threw 61 pitches. Kershaw “probably” will pitch one more rehab start, but he’s in Colorado with the team. Clayton Kershaw just walked into #Dodgers clubhouse. Coors Field games always make me nervous. After all, Matt Kemp and Yasiel Puig nearly died there. I’ll see you on the other side.